I love it! 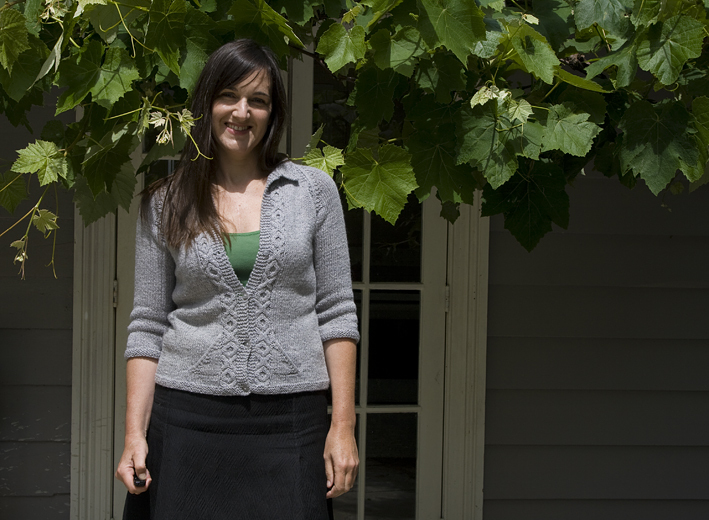 I think it is one of my favourite knitted pieces, and all from recycled yarn! My Mum gave me this unravelled wool from an old jersey about a year ago, and I’ve finally found a use for it. Only problem is, I only used about 6 out of 12 balls for this, so need another bright idea…. 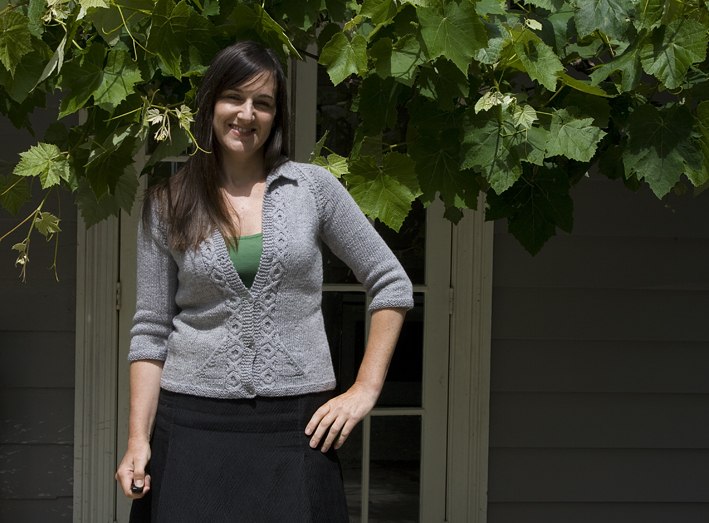 The pattern is from Vogue Knitting W09/10, and is #24 Raglan Cardigan by Tanis Gray. I didn’t love the pattern to begin with, but soon grew to admire its retro feel. It has a rather cute band of XOX cabling adjacent to the garter stitch front bands, and I looove the raglan armhole – it fits perfectly and is cut nice and high, which I like. 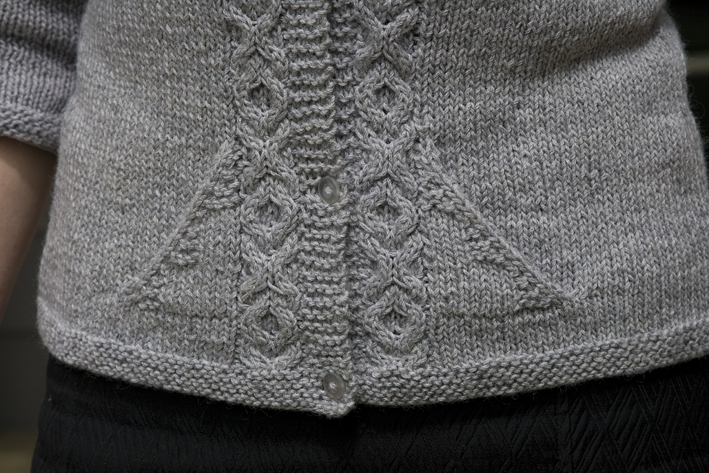 And look – the raglan seam has some neat little garter stitch triangles to accentuate the line. I also love the collar which I did a little altering to – the pattern says to pick up 80 sts along the neck and is knitted straight across, I picked up 68 sts and knitted 4 rows straight, then increased 1st at the shoulder seams every 2nd row, plus a couple of additional increases at the CB, to create a collar with a roll. This makes a collar shaped more like a woven pattern would be – better in my opinion. I should mention I did a couple of waist decreases/increases at the side seams (I’m square enough without shaping!) and I”m glad I did because it seems just right. And did I mention the cutest little totally useless non-functional pockets ever – complete with more garter stitch triangles? I did consider making them larger, but decided the small size was part of the charm. Rather than knit the pocket bag separately as the instructions instruct, I knitted into the front and back of each pocket stitch at the base and did it that way – saves hand sewing! And that’s it! It was a bit cloudy and windy today and I’ve worn it all day, and it is so cosy and comfortable – I highly recommend the pattern and I’m already thinking of knitting another in some olive yarn I have in stash….. Anyway it is Guy Fawkes here tonight, and now it is dusk the whole city is alight with the bangs and pops of fireworks – I’m off to pour a glass of wine and admire the view from our verandah! Wow! I love it! Very nice job. I love the collar too. Maybe you could felt a little messenger bag to go with it.? What a lovely sweater! Those tiny pockets are just perfect – may-be for tucking in a candy for when you need a sugar pick-me-up? Since I never advanced beyond knitting scarves, I can only drool over all the beautiful knit items that I see on blogs. Love it!! I love the open neckline and adorable little pockets. It's the perfect cardigan for wearing over dresses! Wow… beautiful cardigan!! I love all the little details! It is a very cute cardy and one to be worn with pride. I love the wee pockets -perfect to hold a tissue. I love the whole geek chic aesthetic, but in this case it's more chic than geek. The posting time says 3 AM – surely not? Was it a VERY late Guy Fawkes night in your family? Lovely & classic cardigan! Now I've got cardi-envy, though. I'm going to have to dig through my VKs to find that issue. Gorgeous cardigan! I'm taking tentative steps into knitting territory and can only dream of making something so beautiful. If that cardigan were mine, seriously, I'd wear it at least 4 days a week and if I could knit properly I'd probably make it in 3 different colours. Hey, how about dyeing the wool and making it again?! Sherry, that is a beautiful cardi – you've knitted it to perfection. I love the design and you are so clever to be able to alter the pattern like that – fantastic job! Beautiful cardi! I will have to see if I have that issue of Vogue. This makes me want to take up knitting! I'd be terrible- no patience. I love the xox detail. That is some beautiful knitting! 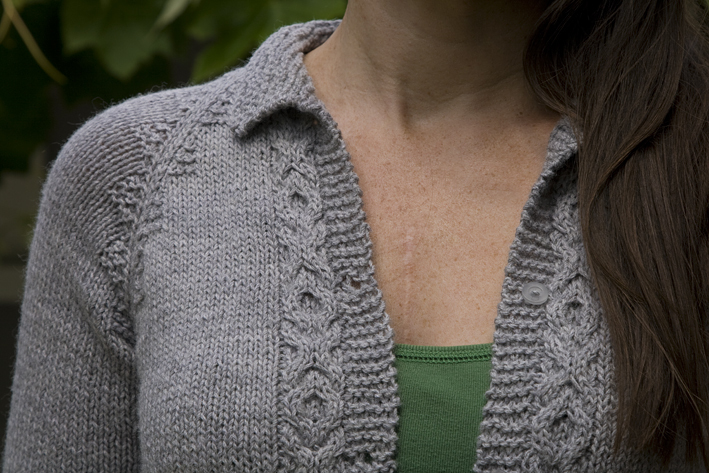 Wow, this cardigan is so pretty! 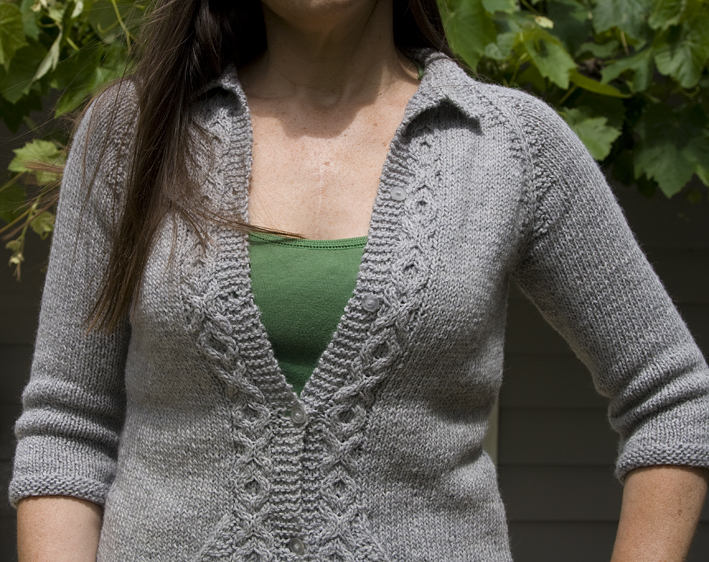 I love the pattern and it looks really nice in the grey raglan! Very nice! I'm eyeing a similar pattern. So when/if I get around to knitting it, I shall look up your notes again. I like what you did to the collar – it looks good. Not surprising given what a talented designer you are! What a fantastic sweater! You did a great job. Gorgeous! I love the changes you made and the pockets are so cute! Very nice cardigan, it looks like a perfect fit too. Just love that detail on the raglan.